the final control element e.g. a heater which acts to keep the temperature of the process at the desired temperature or set point. The main point of our discussion will be the temperature controller because it is at the heart of the temperature control process. A temperature controller has inputs. Temperature controllers can have several types of inputs. The type of input sensor and signal needed may vary depending on the type of controlled process. Typical input sensors include thermocouples and RTDs, and linear inputs such as mV and mA. Controllers can also be set to accept an RTD as a temperature sensing input. A typical RTD would be a 100Ω platinum sensor. A controller can be set to accept voltage or current signals in the millivolt, volt, or milliamp range from other types of sensors such as pressure, level, or flow sensors. Typical input voltage signals include 0 to 5VDC, 1 to 5VDC, 0 to 10VDC and 2 to 10VDC. Controllers may also be set up to accept millivolt signals from sensors that include 0 to 50mVDC and 10 to 50mVDC. Controllers can also accept milliamp signals such as 0 to 20mA or 4 to 20mA. The output from the controller may take one of several forms. The most common forms are time proportional and analog proportional. The electromechanical relay is generally the most economical type, and is usually chosen on systems with cycle times greater than 10seconds, and relatively small loads. Choose an ac solid state relay or dc voltage pulse to drive an external SSR with reliability, since they contain no moving parts. They are also recommended for processes requiring short cycle times. External solid state relays may require an ac or dc control signal. An on-off controller is the simplest form of temperature control device. The output from the controller is either on or off, without a middle state. An on-off controller will switch the output only when the temperature crosses the set point. For heating control, the output is on when the temperature is below the set point, and off above set point. For cooling control, the output is on when the temperature is above set point and off when below set point.There is the possibility of cycling in on-off control. span. The set point is usually in the center of the deadband. On-off control is usually used where a precise control is not necessary. They are also used in systems where the mass of the system is so great that temperatures change extremely slowly, or for a temperature alarm. Proportional control helps to eliminate the cycling associated with traditional on-off control. For a heater temperature control, the proportional controller decreases the average power being supplied to the heater as the temperature approaches set point. This has the effect of slowing down the heater, so that it will not overshoot the set point but will approach the set point and maintain a stable temperature. This proportioning action is achieved by turning the output on and off for short intervals. 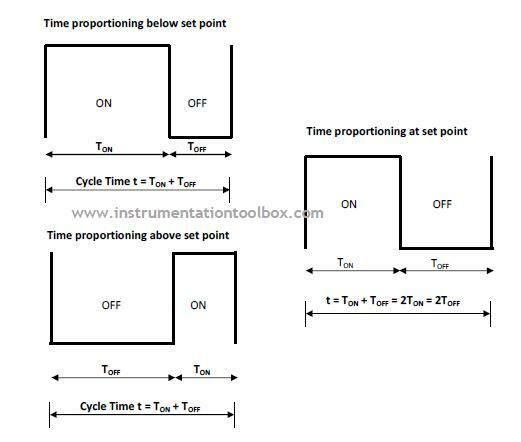 This technique called time proportioning varies the ratio of ON time to OFF time to control the temperature. In time proportioning control, full power is applied to the heater or temperature control device but is cycled on and off, so the average time is varied. This proportioning action occurs within a “proportional band” around the set point temperature. Outside the proportional band, the controller functions as an on-off unit, with the output either fully on (below the band) or fully off (above the band). 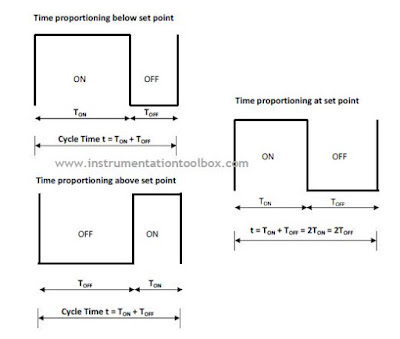 At the set point (the midpoint of the proportional band), the output ON : OFF ratio is 1:1; that is, the on-time and off-time are equal. Inside the proportional band, the output is turned on and off in the ratio of the measurement difference from the set point. 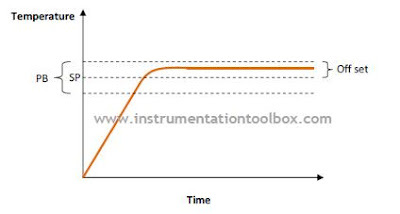 If the temperature is below set point, the output will be ON longer. If the temperature is above set point, the output will be OFF longer. In a commercial temperature controller, the proportional band is usually expressed as a percent of full input range, or degrees. It may also be referred to as gain, which is the reciprocal of the band. The proportional band can be adjustable to tune the controller and ensure a better temperature control experience. Proportional controllers have a manual reset (trim) adjustment, which can be used to adjust for an offset between the steady state temperature and the set point. Proportional controllers are available with electromechanical and solid state relay outputs as well as proportional analog outputs such as 4 – 20mA or 0 to 5VDC. In proportional analog outputs, the actual output level is varied, rather than the on and off times done with a relay output controller. 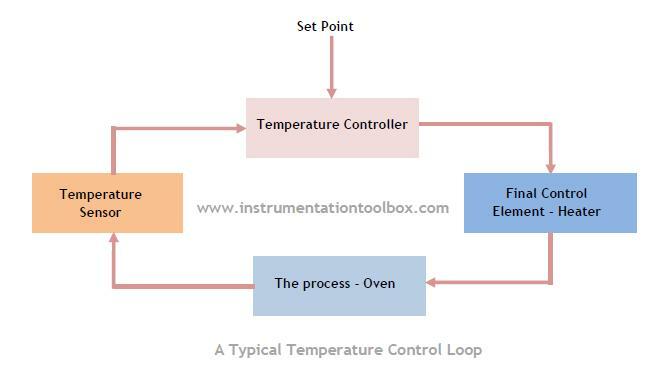 Proportional control can be used in systems that are subject to wide temperature cycling. Processes with long time lags and large maximum rate of rise like in heat exchangers require wide proportional bands (PB) to eliminate temperature oscillation. 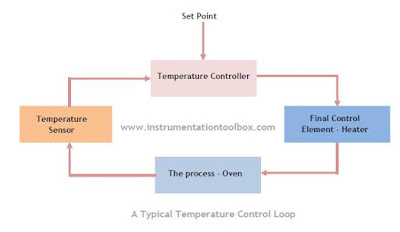 PID controllers are the most sophisticated type of controllers used in temperature control. This controller combines proportional control with two additional adjustments, which helps the controller to automatically compensate for changes in the system. The Integral and Derivative adjustments are expressed in time-based units. They are also referred to by their reciprocals, RESET and RATE respectively. The proportional, integral and derivative components of the PID must be individually tuned to a particular system by trial and error method to achieve good control. PID control is recommended in systems where the load changes often, and the controller is expected to compensate automatically due to frequent changes in set point, the amount of energy available, or the mass to be controlled. 1. What type of input sensor is required? Thermocouple or RTD? Or simply a linear output in mV or mA? 2. Where would the sensing element be placed to achieve good temperature conrol? 3. What type of control is required? Is it on/off, proportional or PID? 4. What type of output hardware is required to power loads? Electromechanical relay? Solid State Relay? Or Analog output signal? 5. What are other system requirements? Display of temperature or set point required? Cooling outputs required? Alarms required? Limits required? Is communication with other devices required?